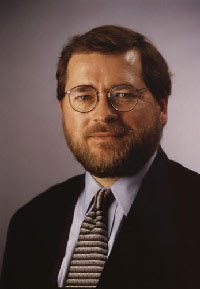 Should Grover Norquist be murdered? According to HuffPost's management --- and the radical leftists that it enables, protects and emboldens to post their threats and urgings of violence against political opponents --- the answer is an emphatic "Yes!" 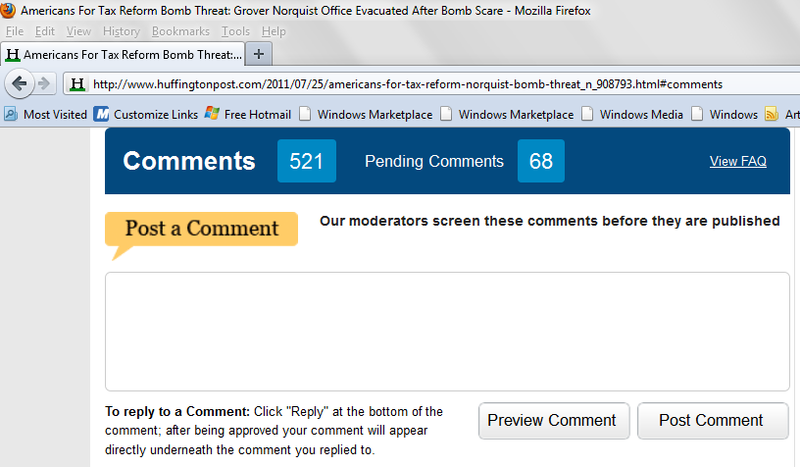 "Americans For Tax Reform Bomb Threat: Grover Norquist Office Evacuated After Bomb Scare"
"(W)e do not allow... speech that advocates or supports hatred or unlawful violence (or) threats of violence or threats to anyone or any group's personal safety... [or] hate speech... or ad hominem attacks of any kind... or speech that is vile... [...]"
Not only is this one of HuffPost's most egregious, long-term lies, as we documented in this special report, in reality, it actually enables and protects the most egregious violators of its policies --- and censors and bans other users who attempt to speak out against them. "Using broad-based communication channels to threaten, harm and intimidate and then incite others to do the same will not be tolerated." If that's the case, then you may want to consider showing the FBI what HuffPost deliberately facilitated on this thread. Learn more, and how to contact them, here. So what kinds of user comments do you think HuffPost reviewed, approved and decided to publish, in response to the bomb scare at Norquist's office? The following is a very small sampling of the "comments" that egregiously violated HuffPost's policies (if not the law) --- yet which it reviewed, approved and decided to publish on this thread (take a look soon, before HuffPost "sanitizes" it). (1) How much do these "comments" differ from those that actual terrorists and their enablers and supporters post at jihadi forums? (2) If your answer is, "not much," then what does that make HuffPost, except a willful enabler of electronic terrorist threats? Also, note how many of these users have 150 to 2,000 or more "fans," meaning that, as indicated in this report, HuffPost has been enabling and protecting them to engage in these egregious violations of its policies for a very, very long time. Too bad it was only a threat, better luck next time. At least someone is trying, try harder you may have better luck next time. HEY GROVER REMEMBER ! PAY-BACK IS A M O F O !!!!!! [...] Norquist might learn that starting a class war might actually mean ... well, war. [...] Certainly if it were a Norquist assassinat­ion, compared to 5% of the nation's children being thrown into poverty ... well, reader, you make the choice. [...] you may have brought it on yourself. Many people have pledged to get rid of you. Oh, please, please, please a real one next time. Traitors who refuse to pay taxes should get no support from the police or FBI. 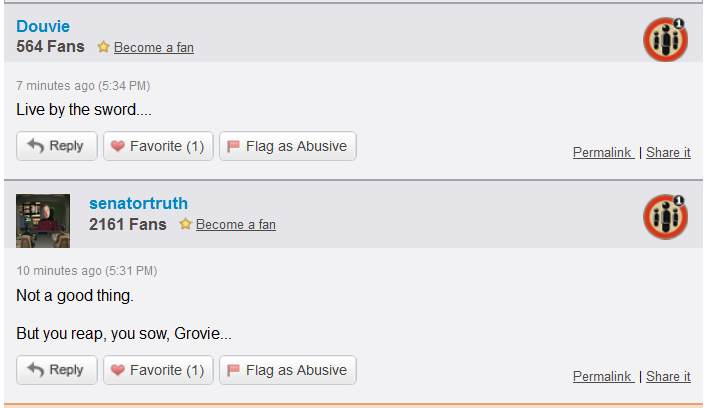 There's a thing called the Social Contract..­.Grover's not a signatory. [...] Mr. Norquist sounds like you need to be careful about promoting government cut backs and no taxes on the ultra rich because it's not only dangerous for other people, but it is dangerous for you too. awwwwwwwww­wwwwww, too bad it was a hoax. I, for one, wouldn't mind it if he were to be vaporized like that. Part of the problems solved. The Right-Wing­ers think they are the only ones that are armed. I think a couple big reminders that they are not would show them how p*ssed America is with them. Maybe even bring this country back toward the middle. There are only two things that enable HuffPost to pathologically engage in this reprehensible behavior. Here's how you can help make a difference, before HuffPost ends up getting someone injured or killed. Suckit bigtime, Beej. And quit living off my taxes.